Doing exercise for people with scoliosis can be very confusing depending on what type of scoliosis you have. This video explains how you can use Pilates exercises to help with your postural scoliosis. Most people with scoliosis don't have a sense of whether they are straight or crooked. I remember mom always telling me to stand up straight, your right shoulder is lower than the right one! Let's look at the two most common scoliosis curvatures and then look at the most effective ways to do Pilates exercise for people with scoliosis. This type of scoliosis consists of two major curves of almost equal degree at the lumbar and thoracic spine. Because they are symmetrical and balanced they are less deforming, but can become a problem if severe. The shoulder is high on the high hip side. The best thing is to stabilize the spine. Standing tall and in tandem with one foot directly in front of the other, hold your balance while squeezing a towel under each armpit. this will help to connect the upper and lower torso for better stability. Find more ways to do Scoliosis Exercises using a foam roller and other equipment from this page. This Curve may be in the thoracic (more common to the right side), lumbar spine (more common to the left), or thoracolumbar that includes both the upper and lower spine. The shoulder is low on the high hip side. You will want to stretch the concave side where the muscles are tight and bunched up. Strengthen the convex side, or where the muscles are long and overstretched. Pad the space under ribs or low back so you have some proprioception for the spine to work with. 1. Bridging exercise as shown or with fingertips against a wall to balance the spine as you roll down. Begin with your hips lifted, feet under your knees. Bring your arms up and overhead as shown, preferably reaching fingertips against a wall for proprioception. Keeping the arms overhead begin peeling the spine down evenly and one vertebra at a time. Then bring the arms up and back to your side to repeat. Repeat for 6-8 repetitions or until you feel less tension in the back. This exercise can be done by supporting the head. The goal is to curl up and look evenly down the midline of your body so that you are working evenly on both sides. In effective stretching the tight side and strengthening the weaker side. Inhale and exhale as you support the head from the abdomen and switch legs folding one while extending the other. Modify this Pilates exercise for scoliosis by putting your feet against a wall and keeping them pressed evenly as you curl up looking down your middle. Be care with too much SI Joint or Pelvic Mobility, may aggravate the condition. Stick with stabilizing the pelvis and keeping it lined up by padding the hollow areas in the back as you lie. Do Side Kicks from a side lying position with your body lined up against a wall for support. Feel your shoulders, buns, and legs flush against a wall, preferably the back of your head too. 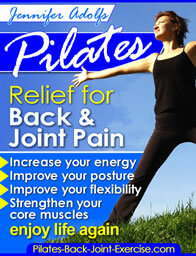 Waist long and lifted, then begin to do the Pilates Side Kick sequence; up down, circles with the top leg, etc. Lying as shown, slide one leg out long along the mat and rest it there. We will work with the leg that is still bent. Begin pressing into the heel and sliding the femur or thigh bone past the kneecap. Nothing will happen externally. Repeat this pressing of the heel and lengthening of the femur bone for 4-5 repetitions, then repeat on the other leg. This Exercise helps to stabilize and correct tensions in the pelvis and lumbar region of the spine. Leave exercise for people with scoliosis and find out more ways Pilates exercises can help with this and other back conditions.